For Hunter’s September sweater (details on all the September sweaters here) this year I decided to go with the lovely wedge chart we included as an example in the Strange Brew pattern. It has a pretty icicle feel to it, and I loved the little diamonds in between. In order to work in this chart I had to make a few small alterations to the stitch count at the yoke. To begin, I knit the sleeves and body per pattern. 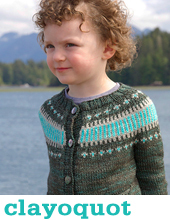 Once I had joined it all together for the yoke I worked short row shaping before starting the yoke patterning. I didn’t want short row shaping above the charts, it seemed better to have the icicles extend all the way to the neckline. The chart was a multiple of 16 sts, so I needed to decrease 216 to 208 sts to accommodate this (13 x 16 = 208). I worked my 8 decreases on the last round of my short row shaping, while picking up my wraps. I used this chart (it’s included within the Strange Brew pattern), which begins as a 16-stitch repeat, and decreases to a 6-stitch repeat by round 34. Next I worked the chart as it was. It was a few rounds taller than I needed for Hunter’s size, but I figured a few rounds wouldn’t break anything. As the chart fit 13 times around this yoke, when I was finished the chart I had 78 sts, rather than the 96 sts I was aiming for in the 8-10 year size. I debated taking it back a few rounds and skipping the last set of decreases (which would have given me 104 sts), but knitting is pretty stretchy and I was already done, so I worked the ribbing, a loose bind off, and it still fit just fine. If it had been too tight, I could have taken it back to round 34 of the chart, skipped the decreases there, and had 104 sts (13 repeats x 8 sts). Then I could have decreased 8 sts to 96 sts before the ribbing. Voila! Hunter loves it, and it can even double as her Christmas sweater in all it’s red and white glory. Tomorrow I will detail Jonesy’s yoke! 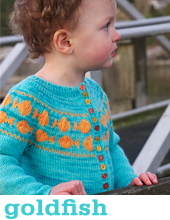 Thank you for the lovely blogs about your strange brew sweaters! Could it be that the first stitch on row 7 should be red? I’m a chart nerd, sorry. Thanks for sharing your tips around this pattern! 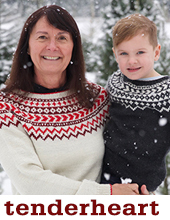 I saw the pictures in your previous post and found the white patterning so simple and beautiful – it will definitely be my next knitting project. Excellent instructional detail in your blog.